The Spider with Red rayon cable and Black components is the perfect model for lovers of warm colors and modern environments: something that steal the gaze! 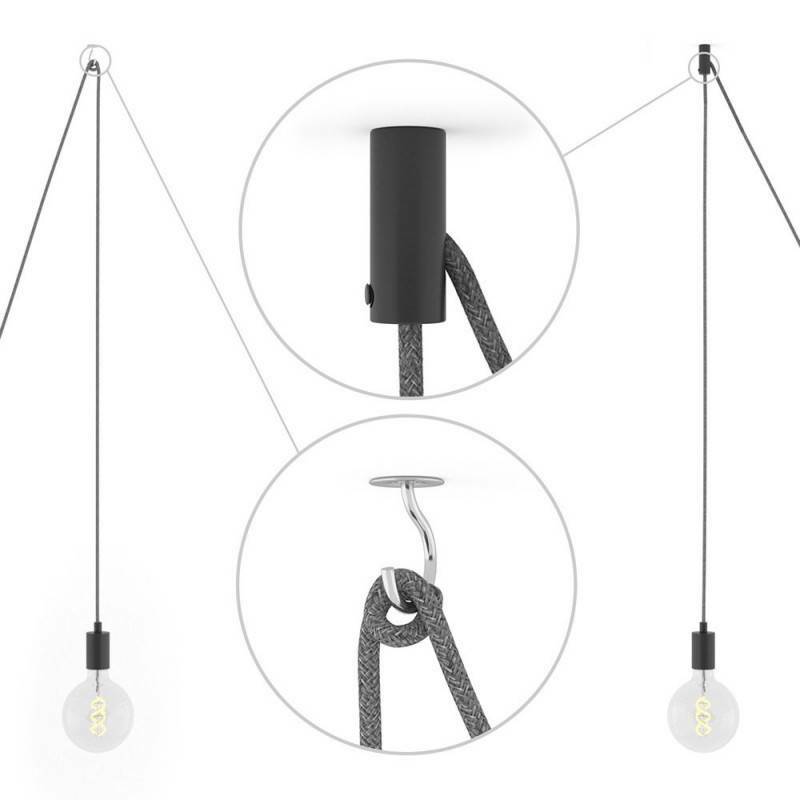 Each of the 5 pendants has a length of 4 meters so that it can be adapted to any room and configuration. 1 black metal rose, diameter 120 with ceiling fixing bracket and earthing (5 holes). 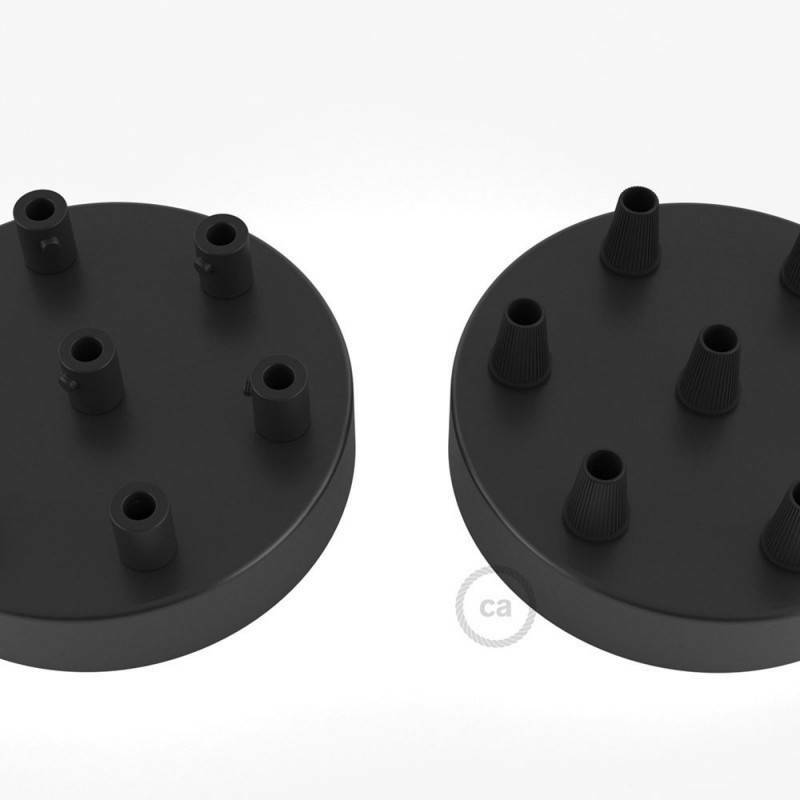 5 E27 lamp holders in thermoplastic material ENEC-IMQ certified with black metal cup. 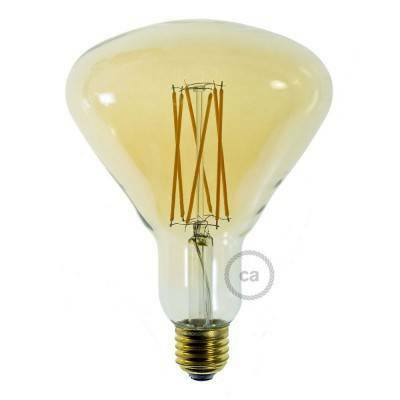 Max 105W for each lamp holder. 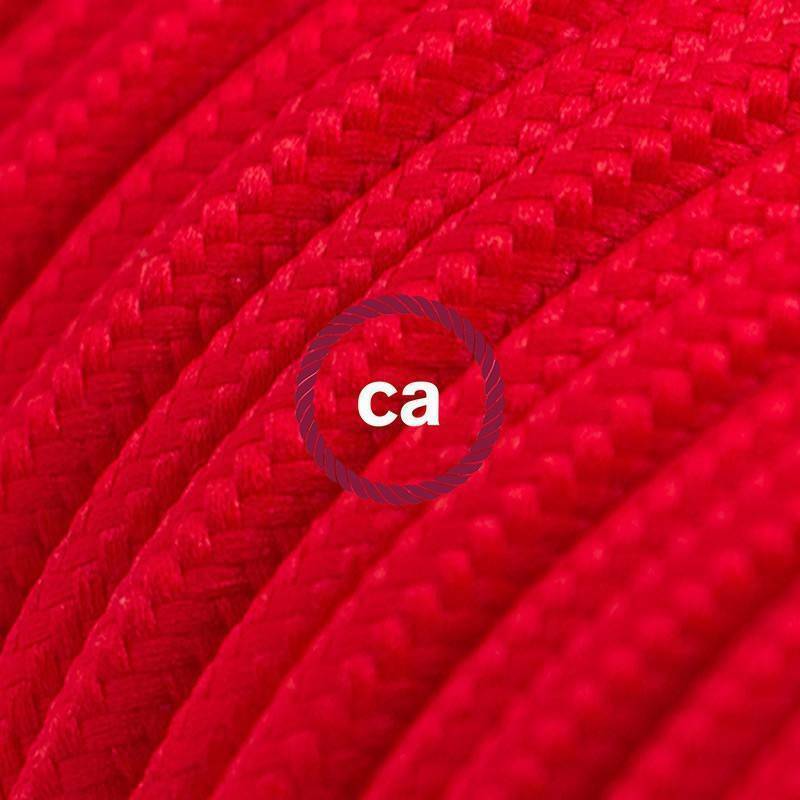 5 pieces of cable H03VVF 2x0,75 IMQ-HAR certified. 10 conical or cylindrical cable clamps, CE certified. 2 WAGO connectors with 5 entries and 1 WAGO connector with 2 entries, both compliant with EN 60998 regulation. Cable ceiling fixing - At your choice, 5 hook anchors or Black decentralizers. 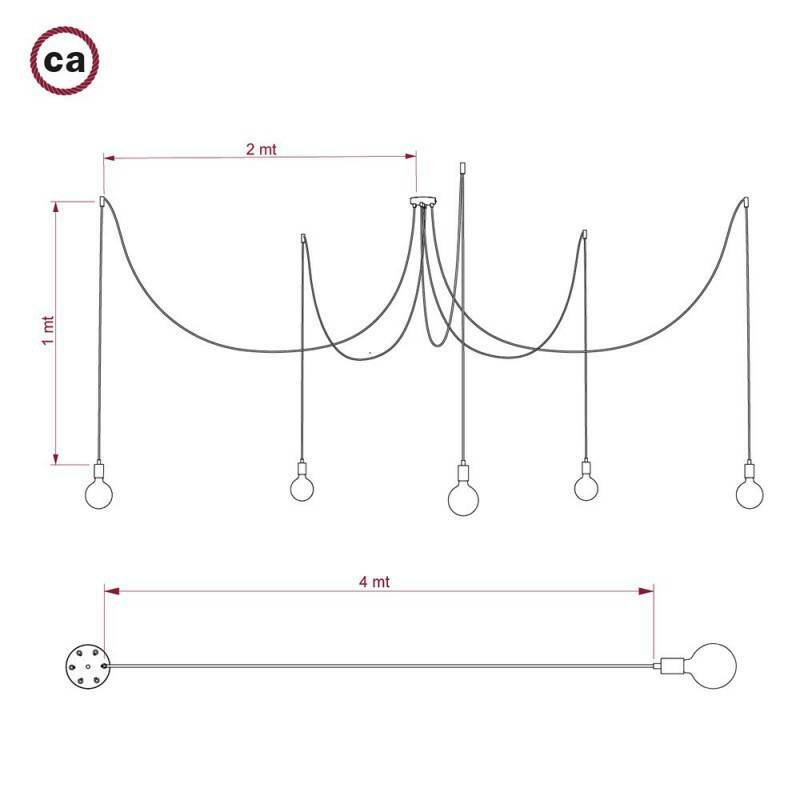 Spider, multiple suspension with 5 pendants, white metal, RM01 White cable, Made in Italy. 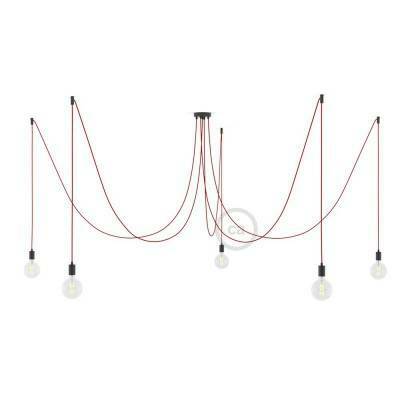 Spider, multiple suspension with 5 pendants, white metal, RM04 Black cable, Made in Italy. 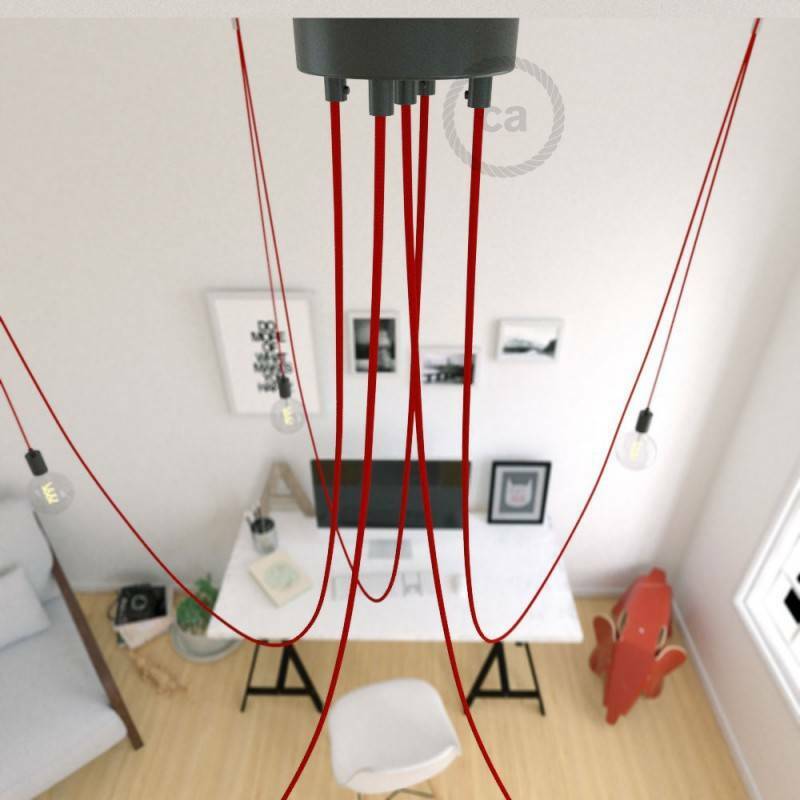 Spider, multiple suspension with 5 pendants, white metal, RM09 Red cable, Made in Italy. Spider, multiple suspension with 5 pendants, white metal, RN02 Grey cable, Made in Italy. Spider, multiple suspension with 5 pendants, white metal, RN06 Jute cable, Made in Italy. 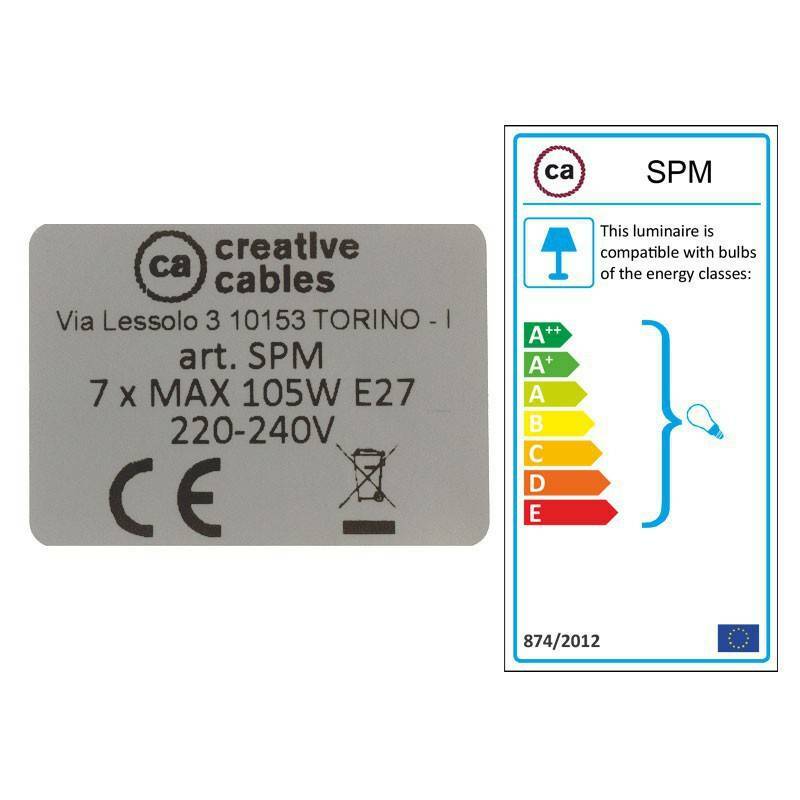 Spider, multiple suspension with 5 pendants, white metal, TN07 Country cable, Made in Italy. Spider, multiple suspension with 5 pendants, black metal, RF10 Neon Yellow cable, Made in Italy. Spider, multiple suspension with 5 pendants, black metal, RM01 White cable, Made in Italy. Spider, multiple suspension with 5 pendants, black metal, RM04 Black cable, Made in Italy. Spider, multiple suspension with 5 pendants, black metal, RN03 Anthracite cable, Made in Italy. Spider, multiple suspension with 5 pendants, chromed metal, RL02 Glittering Silver, Made in Italy. Spider, multiple suspension with 5 pendants, chromed metal, RM01 White cable, Made in Italy. Spider, multiple suspension with 5 pendants, chromed metal, RM04 Black cable, Made in Italy. Spider, multiple suspension with 5 pendants, chromed metal, RM09 Red cable, Made in Italy. Spider, multiple suspension with 5 pendants, chromed metal, RS81 Glittering Black, Made in Italy. 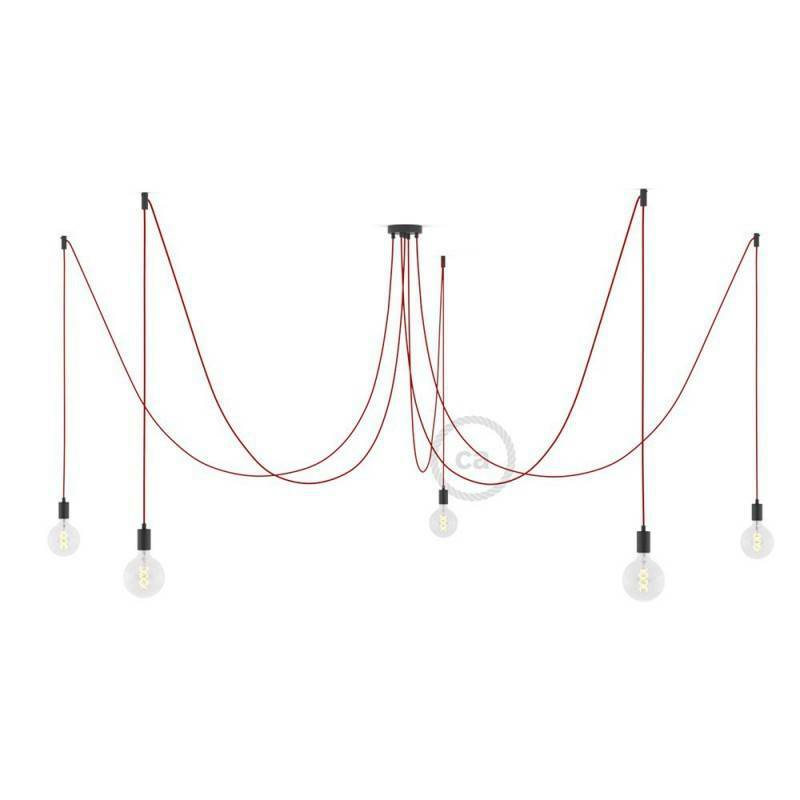 Spider, multiple suspension with 5 pendants, copper metal, RN04 Brown cable, Made in Italy. 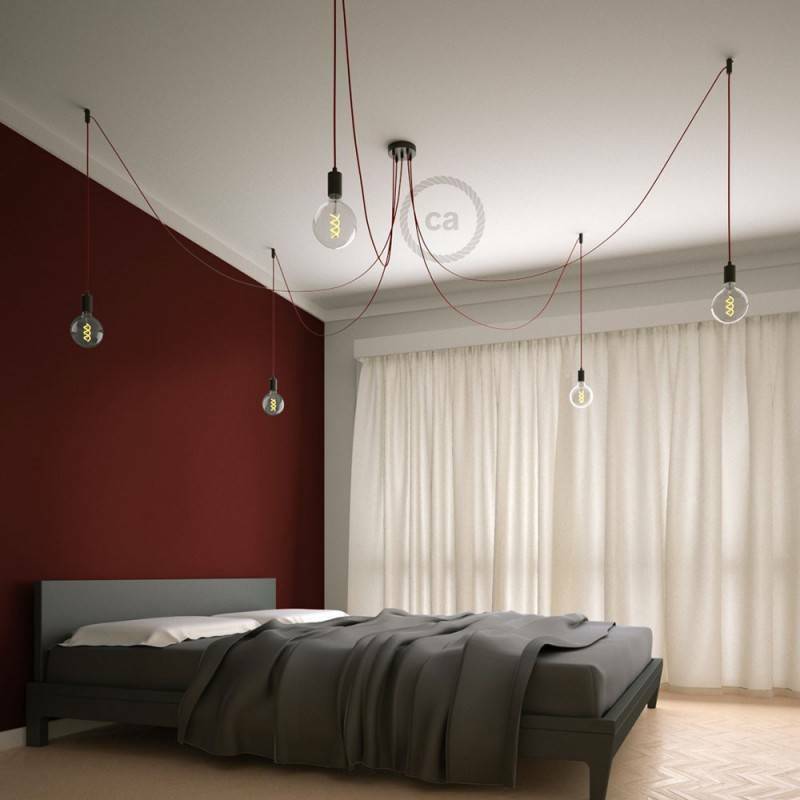 Spider, multiple suspension with 5 pendants, copper metal, RR11 Red Copper cable, Made in Italy. Spider, multiple suspension with 5 pendants, brass metal, RL04 Glittering Black cable, Made in Italy. Spider, multiple suspension with 5 pendants, brass metal, RM19 Burgundy cable, Made in Italy. Spider, multiple suspension with 5 pendants, brass metal, RR13 Brass coloured Copper cable, Made in Italy. Spider, multiple suspension with 5 pendants, black pearl metal, RL03 Glittering Grey cable, Made in Italy. Spider, multiple suspension with 5 pendants, black pearl metal, TG07 Orleans cable, Made in Italy. Yellow ceramic spider, multiple ceiling light with 6-7 pendants, RM10 yellow cable. Made in Italy.